Spring warmth midweek as rising pressure keeps severe weather at bay. 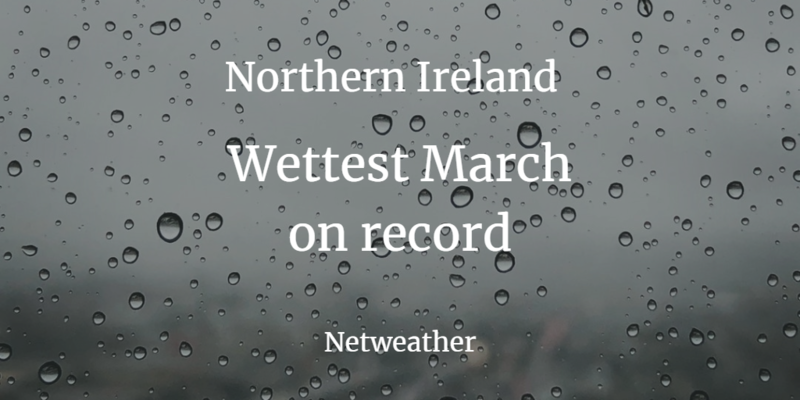 Northern Ireland has recorded its wettest March on record. The previous record is from 1992 and some places have recorded nearly twice the average rainfall with over a week left this month. 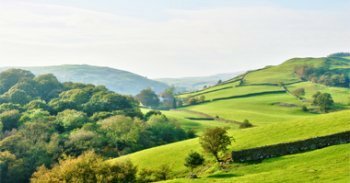 Recording stations in Cumbria, NW Wales, North Yorkshire and Rochdale have already seen double the monthly average rainfall amounts. And of course, there was the flooding at the weekend with a few flood warnings still in place. 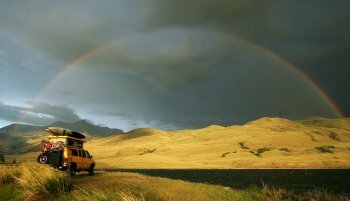 Feel like it has never stopped raining? Today we have a lot of cloud and more damp weather from the west but nothing too heavy. 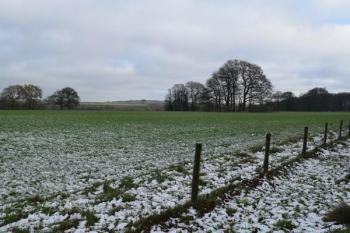 Aberdeenshire saw a minimum temperature overnight of -3C but most places feel milder already this morning. 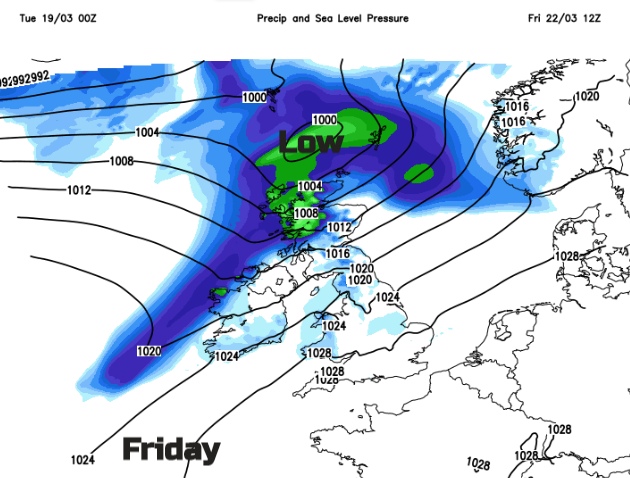 This week a frontal band ripples across or near to the UK day after day. 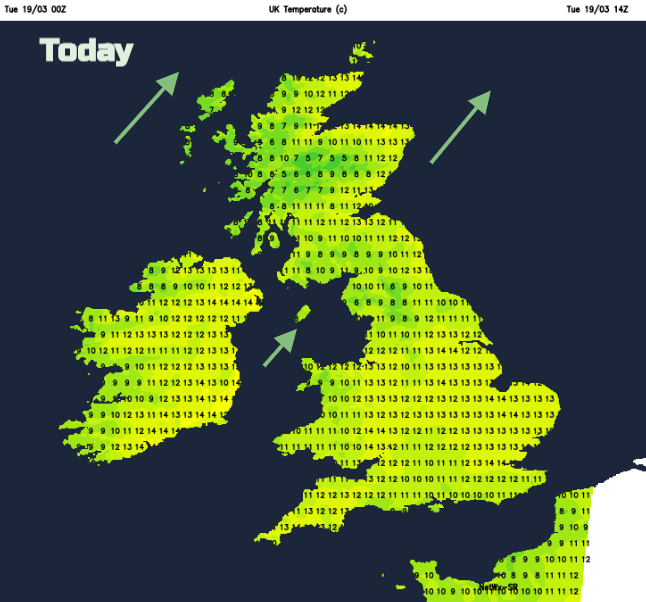 Cooler air remains away to the north with milder conditions over the UK resulting in temperatures above average. Today there is a fair amount of cloud with some bright spells. With a SW breeze over the hills, a few spots to the lee of high ground will do quite well today and tomorrow and see temperatures lifting to 16 or 17C on Wednesday. 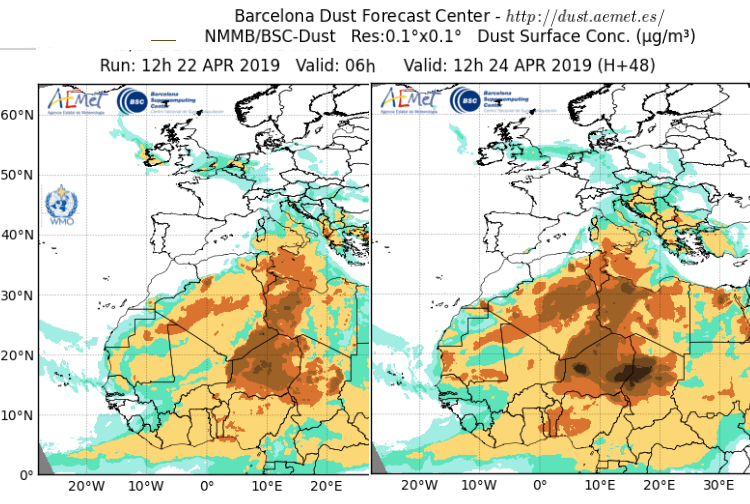 It’s not a completely dry picture but overall it is fair and not that windy. Western Britain and Ireland will still be grey and damp today. 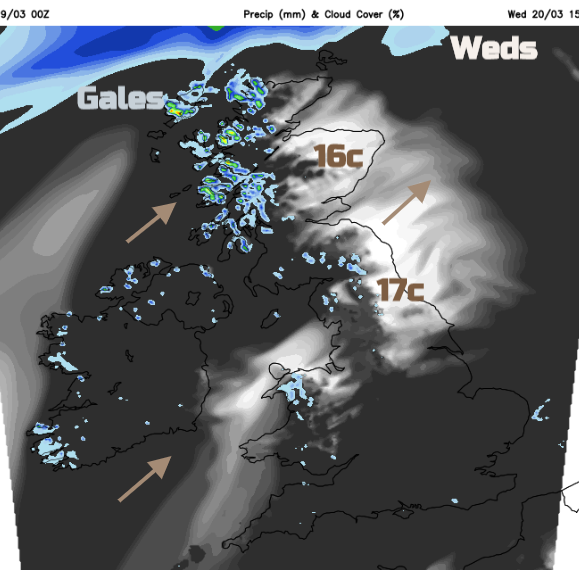 A low pressure brushes past the far NW of Scotland on Wednesday and Thursday so the SW winds pick up here, but the main rain looks to miss even the Western Isles. 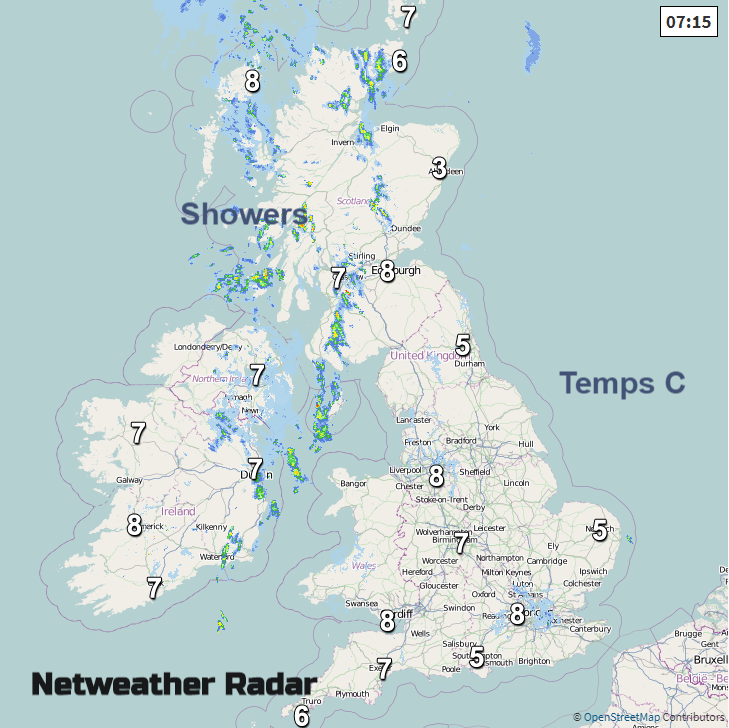 There will be grey skies and dampness for more of the UK with mist and murk by night but it’s not too bad for March. 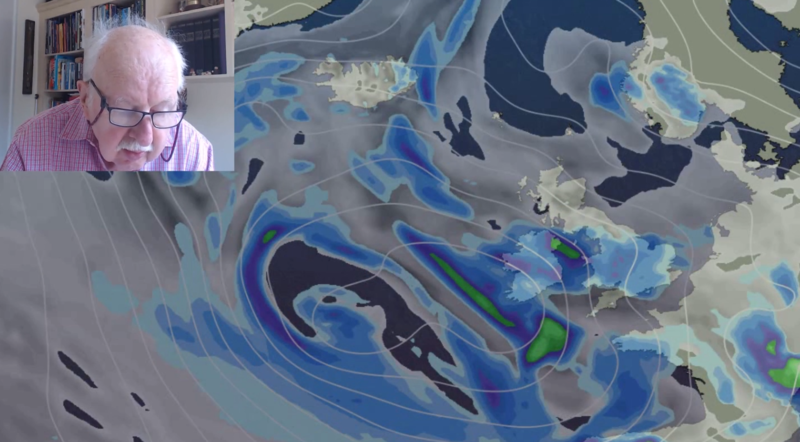 During Friday a low pressure pulls its cold front southwards across the UK, so it will become windy for more areas and rain will cover Northern Ireland and northern Britain by the end of the day. 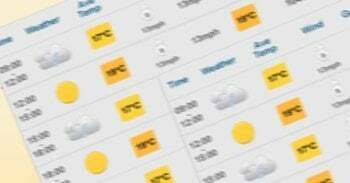 By Friday night it turns chilly for inland Scotland behind the front, but it will still feel mild in southern Britain on Saturday as pressure begins to rise from the west. 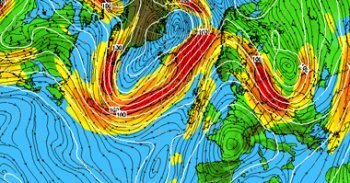 Looking a bit further ahead: high pressure keeps hold across the UK. 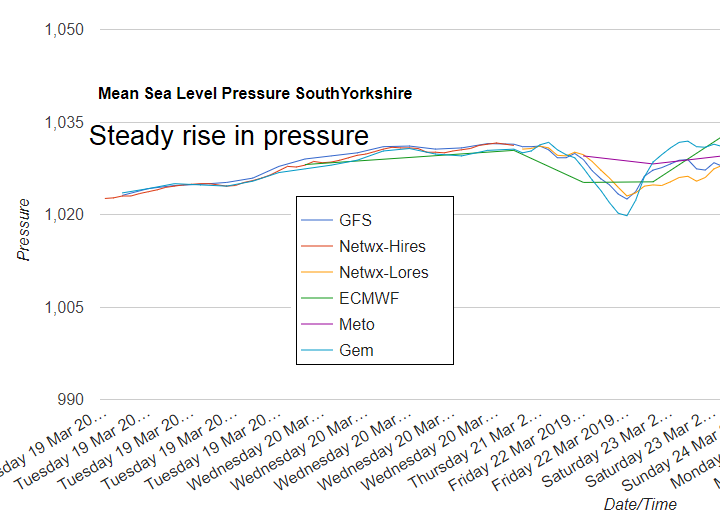 It's not completely dry but this rise in pressure does manage to keep the worst of the very wet and windy weather away from the UK for a bit. The nights cool down as the slack flow takes hold and there will be more mist and fog. It's mild, even feeling warm at times where the sunshine appears for the next few days with temperatures above average. 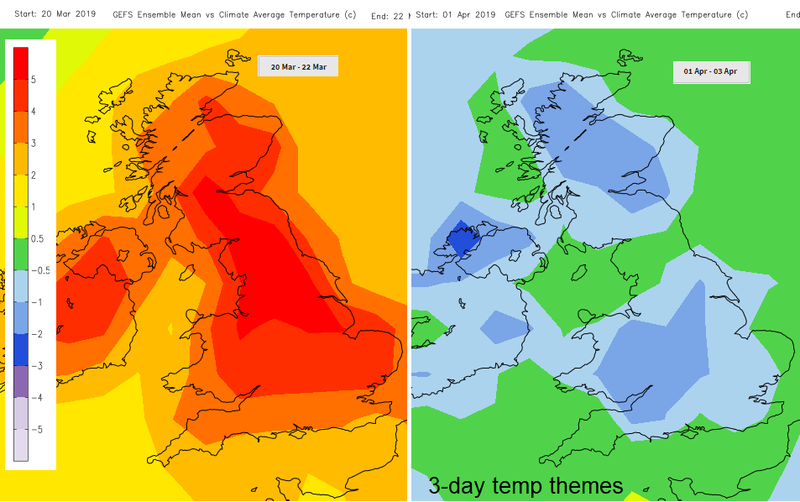 The start of next month looks chiller if the high pressure stays over us or to the west and then draws in cooler air from the east or northeast. A far way off at the moment.